Lock Rekeying Services | Lock Dawg | Change Your Locks Today! These are lock cylinders. To rekey a lock you remove the lock cylinder from the lock housing and replace the pins to work with a new, different key. Lock rekeying is one of the more common services we provide here at Lock Dawg. However, just because we perform this task frequently doesn’t mean that it is an easy one. In fact, lock rekeying is quite technical and requires the skills of an expert locksmith. Our team is equipped to handle this service for you, and we can do it at rates that are as affordable as possible. 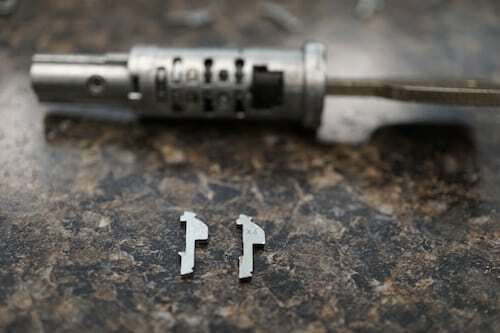 Rekeying a lock is not as simple as just creating new keys for an existing lock. Rekeying the lock requires replacing the locking mechanism with a new one so that the old keys can no longer operate the lock. If you’ve bought a new house and don’t want the previous owners to retain access to the property, rekeying your locks is an affordable option over installing all new locks. Even if the previous owners turned over their keys at the time of the sale, they may still have others, or there may be service providers who were given keys at some point. The more people who have keys to your property, the greater the security risk. 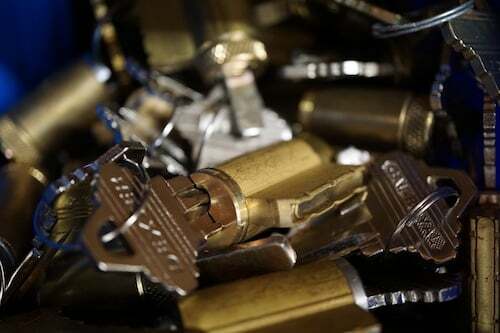 To protect your home and your family, it is best to have the locks rekeyed at your earliest convenience. This is a High-Security Car Ignition Cylinder. In front are the lock wafers. We don’t just rekey locks for homeowners—we can complete this task for businesses as well. Security is especially important for businesses that maintain high volumes of inventory and those who have sensitive, proprietary information. In addition to our lock rekeying services, we provide a number of other locksmith services. These include key duplication, security system installation and more. This way, you always have access to an expert locksmith when you are most in need. Feel free to call on Lock Dawg at any time of the day or night, and we will dispatch a locksmith to your location anywhere in Central Georgia right away. Maintaining our certification and registration requires ongoing education with regards to the latest industry developments. We do everything we can to ensure that we are able to continuously provide our clients with the best locksmith services possible. Get in touch with us today to learn more about what we do and how we can help you.